Mattress Shipped in a Box - How Do they Stack Up Against Retail Stores? Are Mattresses Shipped in a Box As High Quality as Other Mattresses? While at the Vegas Furniture Market Unbox Mattress had a conversation with a mattress retailer who doesn’t have an affiliate program or an appreciate for online mattress retailers. It got a bit heated. Her claim was that mattresses shipped in a box are lower quality than the brands retailers sell. Consumer Reports recently addressed the question – are the mattress shipped in a box as good as traditional mattress brands? The answer? YES! One of the arguments we hear from mattress retailers is that only brands aren’t as durable or as good as their brand names. The technology isn’t as good as say, Tempur-Pedics of the world. Another indication of quality is return rates. Online brands make returns as pain-free as possible and usually have 100+ day return policies. It’s not bad, considering you cannot try out most boxed mattresses before you buy it (though you usually get a full refund, including shipping if you change your mind within the generous return window . 7% of bed-in-a-box that are purchased are returned (according to 1010data, a data analytics company). 2.2% of mattresses sold are returned at Mattress Firm which highly discourages returns with a fee of $79.99 (source). Most consumers are probably deterred by the high fee. Also according to Consumer Reports most people know if they like a bed they lie on within the first 20 minutes so they may get it correct the first time. READ Purple Mattress Memorial Day Sale - Best Deal of the Year! How Much Market Share Do Online Mattress Companies Have? Online brands are still relatively new. Many are startups who’re new to the industry (former online marketers). According to Trade publication Furniture Today, bed in a box mattresses make up 12% of the market in 2017, which is double what it was in 2014 (it took 3 years to double in size). Over time both models – offline and online – are starting to blend. For example, Purple mattress tested their new mattress models in Mattress Firm stores which you could argue is an antithesis of what they stand for. You can try a Leesa at West Elm stores. Casper brings beds to you and has products at Target stores. 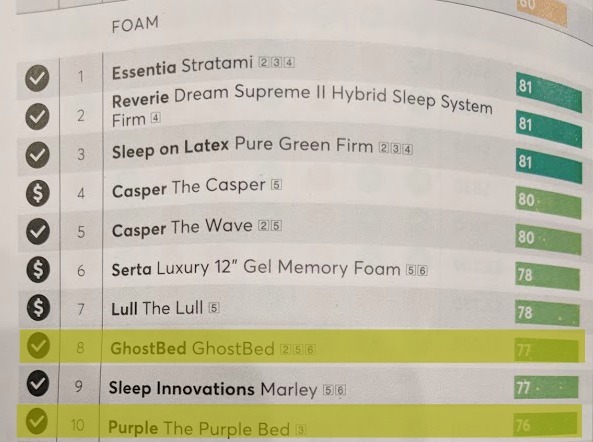 Casper is ranked #4 and #5 for the top rated foam bed in a box mattresses. Use code UNBOX50 to save $50 on Casper. Retailers are hiring ecommerce managers and coming out with boxed bed of their own with creative names that are part of the culture: Sealy has Cocoon. Sleep Number has it Bed. However, it seems less likely they’ll create an affiliate program or work with mattress reviewers as aggressively as online-first brands. Click here to read more about Voila mattress and how you can save 10%. Have you heard of any of the top mattresses shipped in a box? Have you purchased one?